We've partnered with market leaders, Go North Cyprus to bring you holidays to Northern Cyprus, a place where you drive on the left. Go North have over 15 years of experience, specialising in Northern Cyprus, and were the first company to offer consumers everything they need for researching, planning and purchasing their whole trip there. Search and compare Go North's great value deals to a high quality destination on icelolly.com, and relax on the sandy beaches, release your inner adrenaline junkie with some watersports, explore the picturesque landscape or learn a bit of history. Why Book With Go North Cyprus? Every Go North package holiday to Northern Cyprus includes return flights between the UK and North Cyprus, 20kg hold luggage, airport taxes, accommodation and return private taxi transfers. 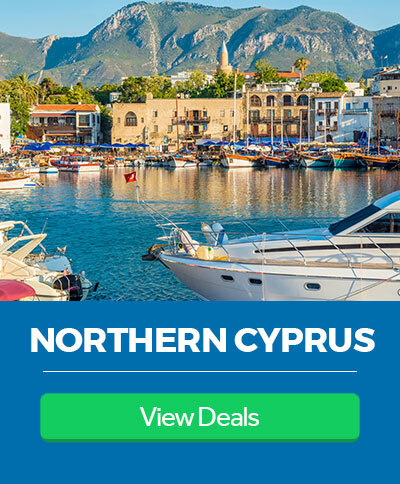 You're guaranteed to get the lowest price when you book with Go North Cyprus as their holiday advisers are based in Northern Cyprus and have great relationships over there. They are are confident that you are paying the lowest price possible for your package holiday, but if you happen to find your holiday cheaper after you have booked, they'll match it. Just contact them within 24 hours of booking with details of the website. You can relax safe in the knowledge that all Go North's holidays are financially protected by ATOL scheme.